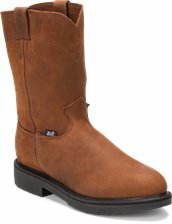 The Balusters Pullon Aged Bark 11, 11-inch tall J-Max® men's pull-on work boot features a rich brown leather exterior with a waterproof shield that protects the foot no matter the conditions. It's built for comfort with the J-Max® Double Comfort System® and J-Max® removable orthotic inserts with J-Flex Flexible Comfort System® Justin Jel® offers a multi-density polyurethane foot bed including low-density foam to cushion initial impact and provide energy return as you walk. The encapsulated air cells virtually eliminate compression set so the bounce of cushioned energy return is present for the life of the boot strategically placed polyurethane gel pads in the heel arch and ball area to reduce muscle fatigue for unparalleled comfort. 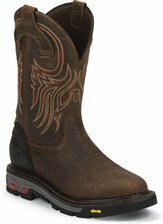 This boot also features the Dri-Lex® cooling system that pulls moisture from the inside of the shoe, leaving the insole dry and cool as well as a durable dual-density polyurethane slip resisting outsole that meets ASTM F2892-11 for electrical hazard safety footwear standards. This style is proudly Made in the USA with global parts. Great fit super comfortable but ! 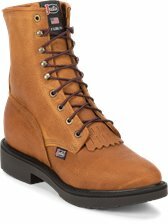 have had these for three weeks now and can honestly say they are the most comfortable work boots ive owned.i have bought only american made boots for work for the last thirty years.these are the best.water proof is a must here in the north west. I am now shopping for my next pair of these boots. 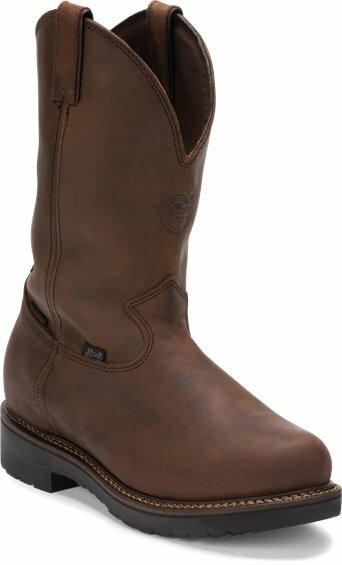 After five years of daily wear in water, dew, mud, manure, oil and worse, stepping on nails, climbing rocks, stirrup wear, spur strap wear, stepped on by horses, blocks dropped on them, with next to no maintenance and a constant wetting and drying cycle, there is a small separation of upper and sole. Still waterproof, though. Oh yes -- I have a Morton's neuroma foot condition. These are the only boots I own that don't hurt. Best boots I have ever owned. Not cheap but worth every penny. American-made. 'Nuff said. Non-Metallic styles feature nylon or fiberglass shanks. Safety toes are lightweight metal free composite that do not conduct heat or cold. Uppers are designed to reduce marking or scratching of work surfaces. These boots will not activate screening devices in high security work environments.